Stampin' Up! 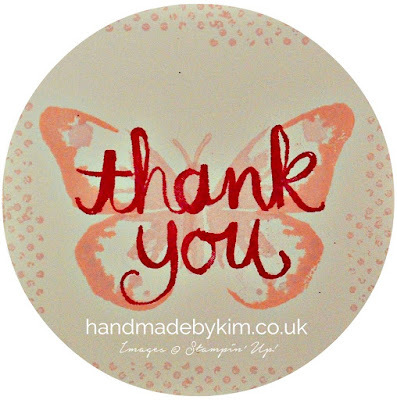 Demonstrator Kim Price - Handmade by Kim: Please vote for my thank you card showcased in Kylie's international blog highlight! Please vote for my thank you card showcased in Kylie's international blog highlight! I'm so excited to be taking part in Kylie Bertucci's International Stampin' Up! Blog Highlight today! Kylie is fantastic at bringing demonstrators and crafters together and showcasing their talents. Its lovely to see women supporting each other, especially seeing it was International Women's day earlier this week! The theme of today's Blog Highlight is Thank You. 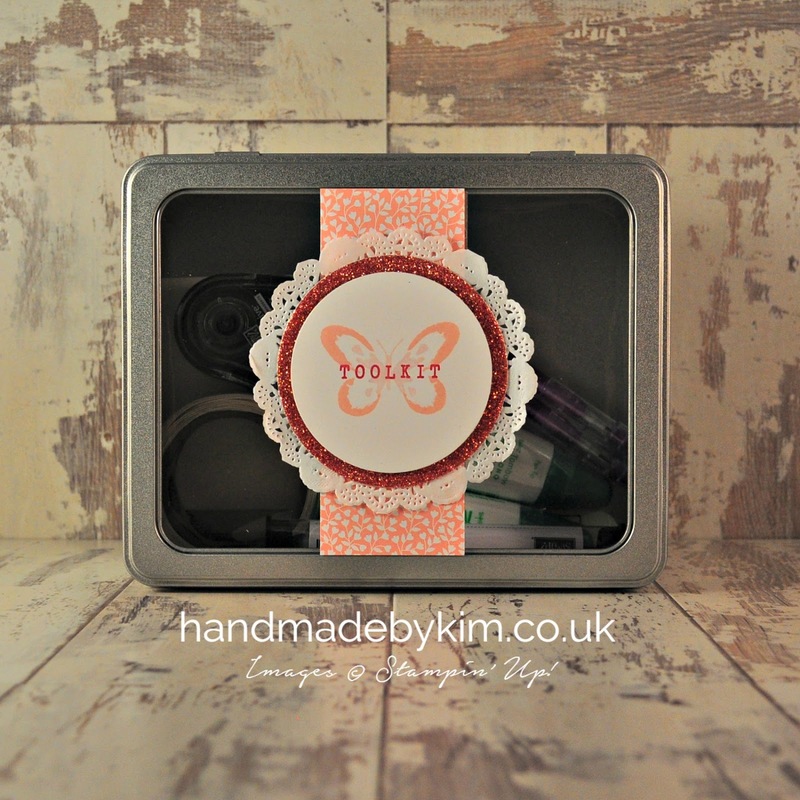 Crafters from all over the world will be voting for their favourite projects showcased on Kylie's blog. My project is a matching set of cards and gifts bags that I made to say thank you to attendees at my very first craft workshop. The gift bags contained an assortment of chocolates, needless to say they were gone in no time! To see pictures from the workshop and the coordinating projects we made for Mothers Day, please click here! The cards and gift bags were really fun to make and with their Blushing Bride base, I had the perfect opportunity to use the new Blushing Bride Glimmer Paper for the matt. 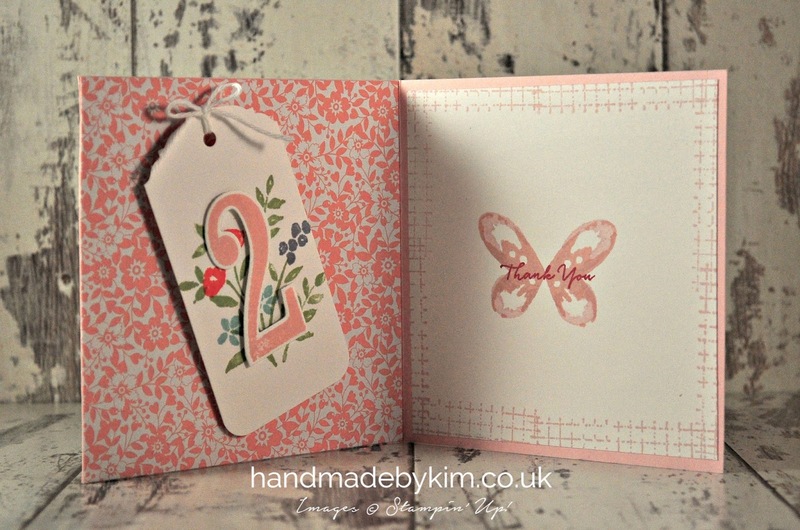 I used Pink Pirouette, Blushing Bride and Rose Red ink and the Watercolour Wings, Watercolour Thank You and Timeless Textures stamp sets to stamp the design on the front of the card and the gift bags. I even made coordinating tool kits - how cute are these? Inside each thank you card was a gift tag numbered 1, 2, 3 or 4 made with the Number of Years stamp set, the Large Numbers Framelits Dies and the Ornate Tag Topper Punch. I placed the four cards down on the four tables randomly and the guest who had number 1, won the Watercolour Wishes Card Kit! No-one walked away empty handed though, the other three guests all took home enough supplies to make 3 cards from the You're So Lovely Project Kit! I hope you've enjoyed looking at my projects today! I would be so happy if you could vote for me by clicking here to visit Kylie's website. To vote, all you need to do is click the heart symbol in the top right hand corner of the photo. You can place 5 votes in total and it would absolutely make my day if you choose my card as one of your top 5. If my card receives enough votes to make it into the overall top 5, I will get a chance to take part in Kylie's international blog hop! I really like the monochromatic color scheme here, and how you layered the sentiment on top of the butterfly. Fits perfectly! Julie thanks for taking the time to leave a comment. I just LOVE using one main colour! Wonderful Kim! I love what you have made super adorable gift bags. I have made sure I pinned them to Pinterest. Thank you for taking part in our international blog highlight and making it such a success! All the best with the voting. Beautiful. I just love the colour combination. Aww thanks Satomi, in everyday life I'm not a "pink" person but most of my craft projects feature this colour? I hope they felt special too Gail! I loved making the whole set. Thank you so much for stopping by and leaving a comment. Thanks Angela! I hope you are enjoying checking out everyone's projects! Love the glimmer paper mat Kim, it makes it pop! Thanks Deb! I was waiting for a chance to use the Blushing Bride Glimmer Paper. I always feel a little guilty using that much for a mat. Thanks Vicki! I love that set too! You made your crafters very special! Love your projects. it is beautiful.